The Marine Electronics Division at Japan Radio Co., Ltd. provides equipment that supports safety and security for vessel worldwide. In an emergency situation that arise in voyage, prompt response is essential to minimize damage and negative impact. Currently e-mail and telephone are the primary methods of communication when underway. However, it is difficult for those on land (shipowners or operating companies) and crews at sea to exchange clear information and work out quick responses in an emergency. Japan Radio’s recent development, J-Marine NeCST, is a total service that aims to resolve these issues, providing safe, secure, and smart operating control. J-Marine NeCST has made it possible to connect to a cloud via the internet, where one can manage and share a variety of information regarding underway vessel with related parties on land in real time. The service adopts a large touch screen panel with a handwritten input function, allowing for operational streamlining and optimization through activities such as drafting voyage plans. In the future, Japan Radio will continue to provide solutions that contribute to safe marine operation. Nisshinbo Brake Inc. is developing a safe and secure friction material for brakes that is installed in cars worldwide. Car ownership is increasing worldwide along with the need to reduce the environmental burdens they cause. Stronger environmental regulations are beginning to spread in response. For example, when a primary pollutant in the United States’ San Francisco Bay was discovered to be copper from friction material in brake pads, Washington State passed a law banning brake pads containing more than 5% copper starting in 2021. Copper improves breaking performance so developing a material that complies with copper regulations while maintaining a reliable breaking performance presented a series of challenges. However, we succeeded in pioneering and launching such a product on the market. When developing new products, Nisshinbo Brake analyzes information regarding relevant international environmental regulations and their trends. Since the year 2000 it has adopted global quality management system standards in the automobile industry. 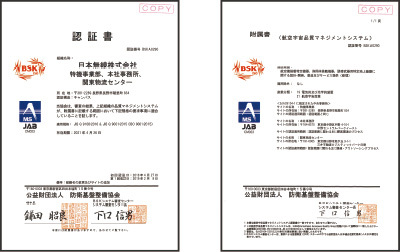 In fiscal 2017, Nisshinbo Brake’s quality management system was certified under IATF 16949, the newest global quality management system standards in the automobile industry. Moving forward, Nisshinbo Brake will continue to strive for improvement and offer safe and secure products. Nisshinbo Mechatronics Inc. supplies customers worldwide with automotive parts and plastic products. Nisshinbo Mechatronics develops parts for brakes and engines that directly lead to automobile safety in its automotive parts business. The company follows IATF 16949 global quality management system standards. It streamlines internal structures from a customer perspective and adheres to them, constructing rigorous quality assurance systems. In the plastic products business, which includes Nanbu Plastics Co., Ltd., Nisshinbo Mechatronics’ Miai Machinery Plant spearheads various quality improvement initiatives. This includes quality assurance meetings with business bases in other countries where employees share information regarding issues, countermeasures and examples of effective improvement strategies. Engineers and quality assurance staff conduct human resources training and guidance at bases in other countries. Through these initiatives, Nisshinbo Mechatronics is unifying its safety and quality mechanisms worldwide. It is important to purify wastewater used at factories and other industrial locations before releasing into rivers and oceans. Generally, bacteria are used to purify wastewater but Nisshinbo Chemical Inc.’s bacterial immobilization carrier for wastewater treatment, AQUAPOROUSGEL, allows their power to be utilized more effectively. AQUAPOROUSGEL is a sponge carrier with a large surface area that absorbs wastewater and quickly sinks. It has a high purification capacity because many bacteria attach to it and colonize. At present, AQUAPOROUSGEL is contributing to water purification not only in Japan but in countries across Asia, such as its contributions to scattered wastewater treatment facilities and industrial wastewater treatment facilities in China and to public sewage treatment plants in the Philippines, as well as activities in Vietnam, Thailand and Taiwan. To ensure proper wastewater treatment, Nisshinbo Chemical also provides after-sales services following delivery of the carriers, which include regular inspections and analyses such as visual examinations and measurements of strength and wear. Through these activities, Nisshinbo Chemical is able to detect abnormalities in the purification process and prevent negative effects on water quality before they occur. In the future, Nisshinbo Chemical will work toward the preservation and conservation of our water environments through the spread of AQUAPOROUSGEL. Nisshinbo Textile Inc.’s wrinkle-resistant processing technology, APOLLOCOT, was selected for the Fiscal 2017 Senken Shimbun Special Natural Fibers Award. To contribute to developments in the synthetic fiber industry, Senken Shimbun, a daily Japanese fashion newspaper, has been presenting awards for 48 years but this award is only the fourth presented regarding natural fibers, which the company started awarding in 2014. Nisshinbo Textile received this award because its APOLLOCOT shirts has become a hit product with over one million units per year sold since its launch in 2009 due to its high resistance to wrinkles and, besides, Nisshinbo Textile has received high praise for its developments in wrinkle-resistant manufacturing over many years. 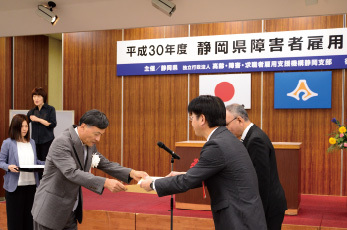 About 120 guests attended the award ceremony, which was conducted on March 14, 2018 and Nisshinbo Textile received a commemorative plaque. Moving forward, Nisshinbo Textile will continue to develop its APOLLOCOT technology and lead the market for new super wrinkle-resistant shirts. Japan Radio Co., Ltd. Received the Excellence in Technological Development Award from Hino Motors, Ltd.
Saeron Automotive (Beijing) Co., Ltd. Received the Award for Excellence in the Quality Competitiveness Department from Mando China Holdings Ltd. Received fiscal 2017 Quality Excellence Commendation from Zhongshan Nissin Industry Co., Ltd.
Nisshinbo Mechatronics (Shanghai) Co., Ltd. 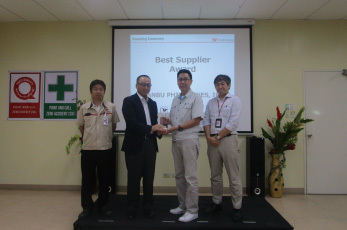 Received Outstanding Supplier Award from Mitsubishi Electric US, Inc.
Nanbu Philippines Incorporated Received the Best Supplier Award from Toyota Boshoku Phil. 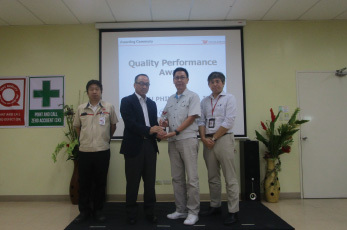 Corp.
Toms Manufacturing Corporation Received Best in Quality Supplier 2017 Award and 5 consecutive years Best in PPM Award from Yamaha Motor Philippines, Inc.